Since you’ve made it here, it’s likely that you are already familiar with the involved process of field dressing game. It can certainly be a rewarding feeling going from the shot, to tracking the buck, to butchering and processing the meat. 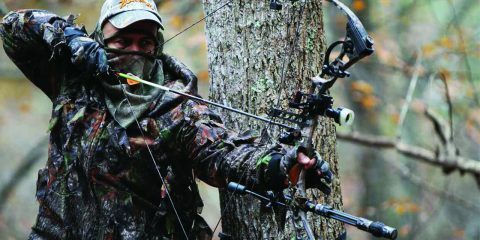 But, there’s no question that each hunter differs in their habits and preferences, especially when it comes to skinning and gutting. As they say, “there’s more than one way to skin a [cat] deer”. With field dressing, you can make the entire process much more streamlined, efficient, and most of all, easier on yourself with a proper set of tools. A dull knife isn’t going to do you any good. You need quality tools that are going to help you from start to finish, from cleanly removing the hide, to butchering the meat. 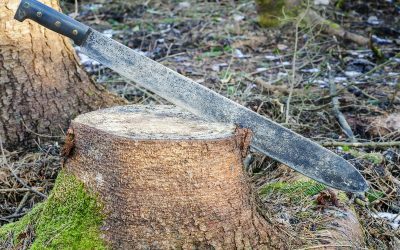 Today we’re going to carefully analyze and review the top 10 best deer skinning knife sets and game processing kits on the market. There’s so many options available that it can certainly be overwhelming. We know from experience. Our goal here is to help you identify which knife set will best meet your personal needs based off of the type of hunter that you are. In a rush for time? Click here to see our TOP deer skinning knife set selection! Number 10 on our list is a hunting knife set from Elk Ridge (manufactured by Master Cutlery). This is an interesting 3 piece set that comes with a skinning knife, caper knife, and fillet knife. It is a great inexpensive kit to handle your field dressing needs. The Elk Ridge ER-261 knives are marketed as being “field tested”, and they certainly hold up to the test. The skinning knife comes with a decent gut hook to process deer. It has a nice size belly, and comfortable handle. The caper knife and fillet knife also have a comfortable rubber handle that will help with a firm grip. Out of the box, you might want to give them a quick sharpen before heading out hunting. The knives maintain a nice edge from the carbon steel with the 440 stainless steel blades. The sheath is designed to carry all 3 knives together, which can be problematic depending on how sharp you make them since they can potentially pierce the pouch. 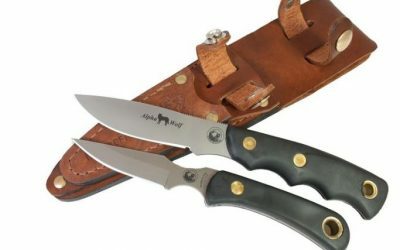 The Elk Ridge ER-261 Hunting Knife Set is a pure value buy. If you’re looking for an extra set of blades to serve in a pinch, or just looking for an inexpensive set, then this is a great option. This set could make for a very nice gift, or even serve as a good starter game processing kit for a newer hunter. It is one of the best skinning knife sets that you can find for (generally) under $20, making it a good deal! The Eastman Outdoor Processing Kit is a very reasonably priced full game processing kit. This 7 piece set includes just about everything you will need process deer: sharp skinning knife, durable caping knife, filet/boning knife, butcher knife, sharpening steel, cutting shears, single handed bone saw and case for storage. These quality knives offer tremendous durability, and sharpness that will prove useful to you in the field. The knives are relatively sharp, and hold a nice edge, which is extremely important for field processing white-tail deer. They have full-tag construction and contour handles that can help reduce dreaded hand fatigue. The stainless steel blades are very durable, sharp and as mentioned, hold a sharp edge. When the blades start to wear down, this skinning knife set also includes a knife sharpener to help replace the edge. If you’re new to game processing and butchering, or want to find an inexpensive set for a new hunter, this set also includes a 2-hour DVD for wild game processing, preparation and cooking. The DVD is excellent to explain the basics, best practices and tips of meat and game processing, which is a nice little bonus that is added to the set. Again, for the money, this is also another fantastic option, especially if you are looking to purchase an inexpensive skinning knife set for a new hunter to practice their processing skills. The knives all come sharp, and when they wear down from usage, there is an included knife sharpener. This can also serve as a BBQ set. It is a great complete set to help you get your deer from the field, to the table. It is a quality set, but keep in mind the affordable price point as well. Expectations should be kept in check as this is not for the every-day hunter who expects their skinning knife to hold an edge through 10 bucks. This is the second Elk Ridge game kit to make our list, however this model is ranked better because of its higher quality and added value. This is a perfect deer skinning knife set that includes everything that you need to get started. 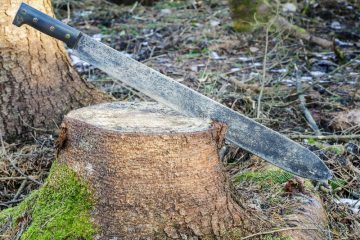 It includes a sharp 9-inch skinning gut-hook knife, an 8-inch caper knife, 12-inch boning knife, 12.5-inch butcher knife, and 12-inch saw. On top of those tools, a sharpening rod, game shears and cutting board are all packaged in in a thick, black, sturdy storage case (which is perfect for staying organized and transporting). The knives are well made and maintain a good balance relative for this price point. While you’re not going to be blown away at the quality of the knives, or their sharpness, they do what they were made to do. You’ll get some good skins, but this is more designed to be a complete set than any one spectacular feature in particular. 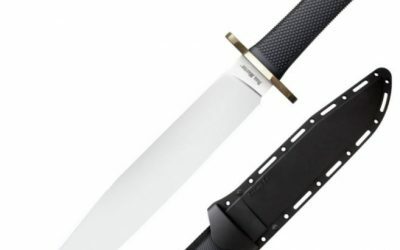 If you’re looking for a complete hunting knife set to buy as a beginner, or occasional user, then this is pretty good value. You’ll get a lot of use out of it for game processing. However, if you’re looking for razor sharp knives, and a top of the line kit, this is not what you need (but you’ll also pay significantly more for that). We have had some really good experiences using Outdoor Edge products, and this game process set does not disappoint. This comes as a lightweight set that truly can handle all aspects of your game processing (“from field to the freezer”). Whether you are looking for a set to process deer, or even something bigger such as moose, caribou and elk, this set is up for the challenge. This set provides quality and durable entry level knives. Included is a caping knife, skinner knife, boning knife, saw, steel stick, ribcage spreader, sharpener, game cleaning gloves all packaged inside of a sturdy carrying case. One complaint is that the knives come somewhat dull from the manufacturer. A simple solution is to break in the new tungsten carbide sharpener as the knives have the capability to become very sharp and hold an edge, but you will need most likely need to do it yourself. Once sharp, the blades aren’t bad, and will give you clean cuts. Moreover, having a sharpener for field sharpens is always handy, and provides tremendous value to this set. The sharpener is one of the highlights of this kit! Another very nice feature to point out is the blaze orange handles. One of the worst feelings is dropping your knife in the dark, and then being unable to locate it! This blaze orange helps to eliminate that problem making them very easy to spot. Additionally, the handles aren’t just vibrant, but are comfortable as well and will hold up even in a pool of blood. The non-slippery handles you’ll find to be extremely useful! Also, amongst many of the skinning knife sets that we have reviewed, we’ve noticed a recurring theme that the case is almost an after-thought for the manufacturer. It is odd because that not only gives off the first impression to the buyer, but is what bundles all of the knives together. Outdoor Edge has actually put time and thought into this case, and is a sturdy case, but one that is also easy to transport. Overall, this set will be the perfect starter set for a new deer hunter, or if you are looking for a set of inexpensive blades. 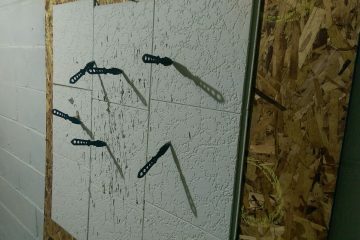 The handles have a great grip to them, and the blades work well enough to handle deer and larger game. If you are looking for an affordable kit instead of buying each piece individually, then this is the kit for you. This is a cheaper set, so expectations need to be realistic. This deer hunting knife set is not the same as the others rated in front of it. Instead of being a complete game processing kit, this knife set specializes for deer skinning, and it does it at a very high level. Included are two razor sharp knives: a 7-inch straight edge, and a 6.5-Inch gut hook knife. Unlike some of the other aforementioned knife sets, Elk-Ridge really focused on developing an in-expensive skinning knife and gut hook knife. Both serve their role well. You won’t have to worry about these knives coming dull from Elk Ridge. Made with 440 stainless steel, they come sharp, retain a very nice edge, and have excellent hardness. They are full tang and ready to skin both big game and small. A good skinning knife offers surgical precision for tight cuts, and that is what the ER-300CA offers. 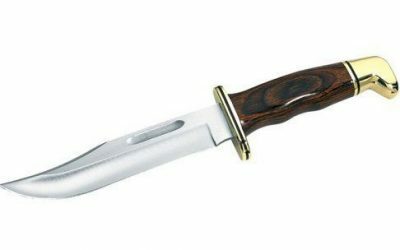 A quality skinning knife should also have a handle that maintains its grip even soaked in blood, and that’s exactly what you get from these knives. The one issue with this set is the sub-par, flimsy sheath. The sheath is made of fabric, and since the blades are so sharp, they can easily tear through the stitching. Subsequently, it can leave the knife tips exposed, which is something that you need to be careful of! This is also the second Outdoor Edge knife set to make our list, and for good reason. This set provides not only tremendous value, but showcases quality craftsmanship to boot. This kit is ideal for handling deer and large big boned animals. Out of the box it includes all the tools that you will need to quickly skin, quarter and debone big game: a caping knife, gut hook knife, boning knife, saw, sharpener, steel stick, game cleaning gloves, nylon roll-pack, plastic knife scabbards and a convenient case. This set is perfect for field work as it was designed to be functional, lightweight and best of all, portable. You’ll be able to make all of the necessary cuts to butcher a deer as the set was essentially designed to get you into the cavity, remove the organs to preserve the meat and split the pelvis as necessary. The rib cage spreader is one of the best features of the set as it works well for gutting deer, and providing easier access to the internals. The saw is also sturdy and can cut right through the bone to open the chest cavity. The knives in this set come very sharp, and with good edge holding steels (carbon 420 stainless steel). They come fastened with comfortable rubberize handles that will help you maintain a secure grip on the knife, even when wet. Each knife has full tang construction which helps to provide them with additional strength. Another great feature about this set is the nylon roll pack which also converts to a belt scabbard. This is an incredibly useful addition because it makes all of your tools readily accessible to you. Instead of having to lay your tools on the ground, you will have everything on you. Not all sets include gloves, which is a nice add by Outdoor Edge for sanitation and clean-up. The case helps to keep everything together and organized, and is pretty easy to carry to take it on the go. This is an excellent deer skinning knife set by Outdoor Edge, but not even their best one (keep reading)! If you are on a budget, but still demand a quality set, then look no further than the Outdoor Edge Butcher-Lite BL-1. This set is perfect for field work, with sharp skinning knives to a powerful saw. You’ll find field dressing become a much easier and quicker process! Wow! That’s a pretty good way of describing this deer skinning knife set by Ruko. This is one of the most expensive knife sets on this list, but it is overflowing with quality. While Made in Spain, everything is handcrafted to an astounding level. This is not a complete game processing kit like several aforementioned sets. Instead, this set comes with a caping knife and a gut hook skinning knife. Both of these knives are handcrafted with genuine deer horn handles, solid brass guard and pommel cap. If you have larger hands, these were meant for you. Ruko takes this list to the next level. These knives come razor sharp with 440A stainless steel blades that are perfect for skinning and butchery. 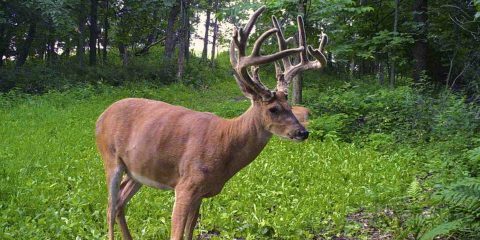 Not only are they sharp, but they have terrific edge retention that will last you for numerous deer. Additionally, since these are specifically designed for deer skinning (you might even say that the deer horn material helps to give it away), there was an added emphasis placed on the gut hook. Many companies will simply tack on a gut hook to their skinning knife just to add it. In those cases it is sub-par, dull, and would be preferable to not even have it. However, on this knife, the gut hook is one of the premier features as it is designed to help you in the field to unzip buck, not merely look ‘good’. The handles are comfortable to the grip, and you’ll find these knives light and easy to carry. 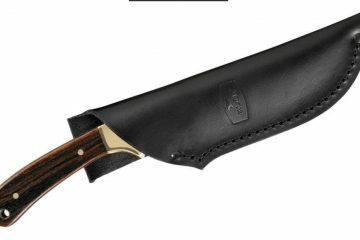 These knives also come with genuine full grain leather sheath which is an extremely nice touch. If you’re interested in a full deer game processing kit, then this is not for you. This is for the serious hunter who wants a very good caper and skinning knife. These are high-end, quality skinning knives with beautiful steel and leather. Made in Spain, they were made with impressive handcrafted quality, and have great edge retention. When you first get them, you’ll want to just admire their craftsmanship. If you’re not on a budget, you will be doing yourself a disservice by not even considering this set. As you’ll learn from experience with knives, you get what you pay for, and the quality on these is remarkable. PUMA has become a brand known for their craftsmanship, high grade stainless steel, genuine handles and innovative designs. For PUMA SGB, PUMA uses German sourced steel, and is highly regarded for their genuine materials and leather. This is another quality skinning knife set that will more than handle most hunter’s skinning needs. This versatile set comes with a gut hook knife, caping knife, and a fleshing knife. While the knives are on the smaller-end, they pack a serious punch. 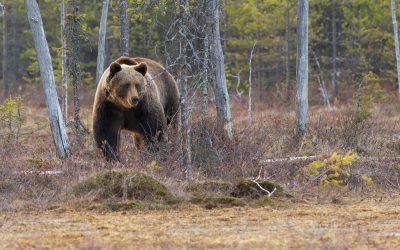 They can effectively handle almost any sized game, from squirrel to elk. They are very small and sharp knives that will allow you to make detailed and precise cuts. Even though they are small, they have a nice compact weight to them. These knives have 440A stainless steel. It may not be top of the line, but it still holds a very sharp edge. The last thing that you want is steel that is so hard that once its initial sharpness wears down, it is nearly impossible to re-sharpen. This steel is hard enough stay sharp, and once it dulls down from wear, is easy to get sharp again. PUMA has also focused on creating an attractive knife set. These knives have such a great fit and finish to them, you may just want to keep them for display. PUMA may not get as much attention as a brand like Buck Knives, but they produce excellent crafted knives. If you’re looking for something a little higher-end, this a set worth considering. It will be able to handle any size game, and look good while doing it too! If you were wondering when a Buck Knives’ product was going to land on our list, this is merely a testament to the quality products that they consistently put out (and why it is so high on the list). 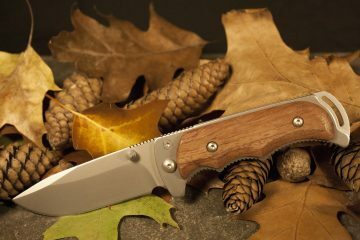 Buck has built a very strong brand as an American company known to fully stand behind their blades. The Buck Knives 0141VP is not a complete game processing kit (i.e. with a saw, butchering knife, and so forth), but another kit that is designed to be an ideal deer skinner knife set. This set includes a skinning blade, a caping blade, a gut hook ring, and a heavy-duty nylon sheath. Even though it doesn’t come with as many pieces as the other listed sets, the knives are so sharp and high-quality that you could even use this set from field dressing to butchering if you so choose. For the money, these are superb quality. Weighing in at 12 ounces, the entire set is the same weight as a can of soda! There’s a reason this series is called PakLite – it’s all about lightweight! These knives are shipped extremely sharp by Buck Knives, making your cuts effortless as you glide through your buck … like hot butter. They have no trouble maintaining an edge, even if you accidentally hit a bone or two. Both knives are fixed blades and perfect for gutting with “advanced edge2x blade technology”. If you’re looking for a fancy design, or a “beautiful” set, then this set is not for you. These have very minimalist designs – they’re not trying to be fancy, or feature any gimmicks. These knives are about being surgically precise and efficient while field dressing. The skinner knife has a skeletonized design – no conventional handles. It has nice jimping for your palm and thumb keeping things simple. They are very simple to clean, and almost impervious to the elements as they won’t slip when it gets wet with their black traction coating. They offer great control and maneuverability in the field. Normally a pain is cleaning the knife after game processing having to deal with blood, fat and hair getting stuck. These knives avoid that problem as there is no space for it to get stuck in. These are ideal for a simple clean! These knives are strong and remain a sharp edge with Buck’s standard 420HC. This steel offers a wear resistance similar to that of a high carbon alloy, but compares to chromium stainless steels with its corrosion resistance. The combination leads to superb strength, corrosion and wear resistance, durability and an easy to re-sharpen blade. They come inside a heavy-duty black nylon sheath with removable liners, zipper storage, and a buckled flap over top. The pocket in the flap is perfect for including a sharpening stone. Lastly, should you have any issues, it’s nice to know that Buck always stands behind their product with a Buck Forever Warranty. 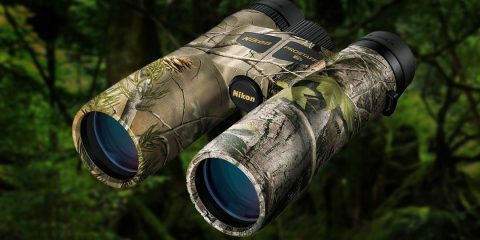 This is a great set if you are intended to use it for field dressing big game (deer, elk, moose, etc.). The knives are razor sharp, and have great edge retention. They are minimalistic, and a breeze to clean! They’re a great looking lightweight set, but most importantly they are quality knives. For the money, this is one of the most complete options for a deer skinning and game processing set. Outdoor Edge truly went all out including everything, and more, that you reasonably need to process game. This set includes a gut hook knife, caping knife, boning and fillet knife, butcher knife, carbide sharpener, stick spreader, game shears, carving fork, cutting board, bone saw, game cleaning gloves, and it all comes conveniently packaged inside of a compact, portable case. This set really helps transform skinning from a painful, time staking process and ordeal into a breeze. The knives all come sturdy, durable, razor sharp, and maintain their edge with high carbon 420 stainless steel. The gut hooks work very well for slicing through hide, and the caping knife allows for small, controllable cuts while cleaning out game. They all have full-tang construction packing them with extra strength. When you’re processing game for a while, comfort is a huge issue. These are designed to withstand long usage with their rubberized handles. They render bloody and wet conditions obsolete with their rubberized, textured handles that provide a good solid grip. The sharpener works excellent when the knives start to wear down and it only takes a few swipes to get them back to being razor sharp. The saw that is included has huge teeth, the shears are heavy duty and the boning saw can cut through a sternum and pelvis with ease. The one major ‘con’ about this set is the case, which is something we’ve mentioned before in other reviews. This would have no downsides if it weren’t for the case that feels cheap and flimsy. Many complain about their cases breaking down, which is truly a disappointment for such a quality set. With that being said, the entire set is still easily portable in a backpack or bag, so it does have some advantages being as compact as it is. Looking past the case, this set is everything that you need to field dress and cut up meat for processing. It’s an economical, but exceptional knife set. The knives are durable and come razor sharp, and will be able to handle all of your skinning needs. For some hunters, this set will help put an end to having to sneak out those kitchen knives! For the money, this is a really hard set to not be pleased with!